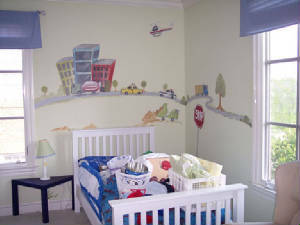 After years of coming up with ideas and painting nurseries for clients, Sandy Boone finally had the chance to paint a room for her own expected baby. The baby's gender was to be a surprise, so she needed to keep the room neutral. Two base coats were chosen. 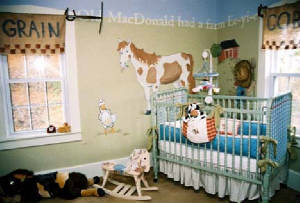 The Theme was Old Mac Donald had a farm because of the love of farm life her and her husband Jason share. A Sage green color was painted 3/4 way up and a grayish blue was painted above that, along with the ceiling. The words to the song were painted in a cream color between the two base colors. 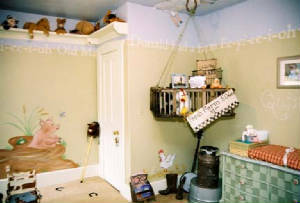 Soft friendly farm animals including their own horse Dakota surrounded the room along with a farmer, their barn and clouds nestled around the ceiling light. 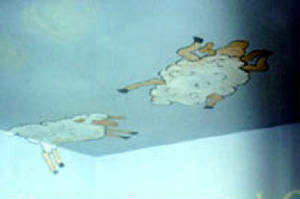 Sheep were painted on the ceiling jumping over the hand painted dresser/changing table. A garage sale crib and dresser find were painted to coordinate. 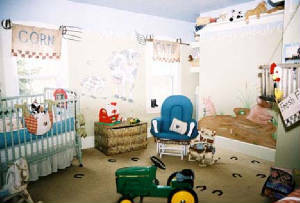 Just think this room was painted while Sandy was 7&8 months pregnant after moving into their newly purchased home.